Back in July of last year I finally got around to giving my thoughts (probably much to the displeasure of the company) on Commes des Garςons 2, a unisex fragrance. 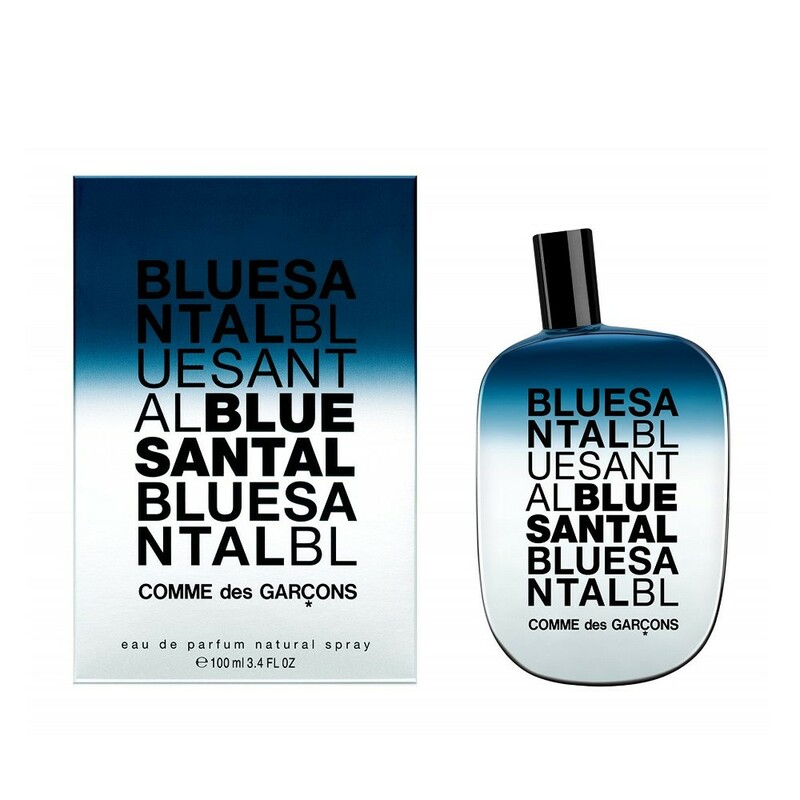 I hated it, so I was quite surprised to be offered a sample of their new fragrance Commes des Garςons Blue Santal to get my nose around. At an eye-watering £75 for 100ml from House of Fraser here it was a case of nothing ventured, nothing gained when it came to getting my hooter around the sample. ‘In the summer of 2013 Comme des Garcons launched the collection of Blue Invasion which includes three "blue" fragrances— Blue Encens, Blue Cedrat and Blue Santal, in characteristic flacons colored in blue, iridescent from the darkest to the lightest shade. The new perfumes are created to accentuate radical contradiction providing a mixture of luxurious warmth and sea freshness. The olfactory evocation of the fascinating paradox presents the blue color as timeless and very intense in three different ways. BLUE SANTAL provides frozen and cold Australian sandalwood combined with warm pine notes and tartness originating from juniper berries. As soon as I sprayed a little of the Blue Santal it became very clear, very quickly to me that this was much stronger than Commes des Garςons 2 (my main bugbear with that was it was so subtle you had to reapply every ten minutes). The initial fragrance seems dominated by the pine and berries. They blend and give a first impression of sitting in a pine forest while snorting on berry juice, the pine being the over-riding note - fresh, clean and very manly. The berries sit behind this fragrance providing a subtle depth to the initial blast. I have to put my hands up here and say that I was impressed - the first impression stuck and the feeling/memories that were awakened when smelling this a big plus for me. After five to ten minutes however as the pepper started to come to the fore the complete blend had hints of cat urine - the fragrance became very bitter on the nose for a good ten minutes before it finally dried down completely. At dry down the fragrance thankfully became lovely again, although it became significantly heavier on the nose. While pine can still be detected, the freshness of the berries disappears completely. Throw into the mix the depth and warmth provided by the sandalwood base and this screams ‘I am man’. The pine and sandalwood complement each other perfectly. This is like a rollercoaster of a fragrance the likes of which I had never smelt before. Starting so fresh and wonderful the heart notes just knock me that little bit sick but with a bit of perseverance once it dries down to the base notes it once again becomes an absolutely outstanding masculine fragrance. As the transformation of the fragrance takes just thirty short minutes this is one I would buy, but apply well before leaving the house. When looking around I found some people who said that this reminded them of Gucci Rush (oh dear, that is one foul fragrance) and I’m inclined to agree if you just take how it blends and smells shortly after application but it couldn’t be further from Gucci Rush after around fifteen minutes so I think the association is literally bang out of order. Applying the value for money test and the unease caused by the application and changes in fragrance sees Blue Santal fall down from one that I would rush out to buy. I would recommend it as the final fragrance is lovely but this is expensive stuff and personally I feel there are better options out there. If price is no barrier for you then I would say take the plunge, the online reviews I have seen of this are overly harsh and as no lover of the brand or their previous offerings I can hand on heart recommend this to people who like their earthy offerings and warm masculine fragrances. I am not too keen on unisex fragrances. I prefer to stick to my old favourites. I love the idea of trying out a sample before committing yourself to the full sized product. Perfume / cologne samples are also great to use not he go! Mediterranean Pine & Sandalwood sound lovely! It would have been nice for them to send you a proper bottle even if it was a smaller one. I am (cynically) convinced that sample products are always much stronger than the retail product! i wish my husband wore perfume but he doesn't! Mine wouldn't wear it, just like Cass' as he would say it was too expensive! I think it's really difficult to choose perfume/ aftershave for someone else so I would leave it up to him, I'm afraid. Good to read your review. I love shopping for male fragrances as gifts. this one sounds really great! I'd not heard of CDG before. We have our preferred brands and tend to stick with them nearly all of the time. I adore the look of their perfumes. They all have the same shape bottle with the stand but colours are simply fab, especially Amazingreen with its dark green bottle. I am going to get my Hubby this tester to see if he likes it! Good review, Male perfume is so difficult for me to choose for my other half as a gift! I always struggle to choose male fragrances so any help or recommendations are always appreciated.